Established in 1969, Garden Bay Marine Provincial Park provides 200 metres of shoreline, with a backdrop rising to the summit of Mount Daniel. A part of Pender Harbour, this is a popular boating area with secure anchorage and a small dinghy dock. This park provides excellent opportunities for fishing, picnicking and swimming. There are many marinas, stores, resorts, restaurants, repair facilities and fuel outlets located near the park. Garden Bay Marine Provincial Park is open all year; there are no fees. There are no sani-station/dump facilities available. No sewage discharge in anchorage; all vessels must be equipped with holding tanks. The park is located 30 km from Sechelt, on the Sechelt Peninsula. Follow Highway 101 north past Madeira Park; turn left on Garden Bay Road. At Garden Bay Lake keep left and drive approximately 2 km to Claydon Road. 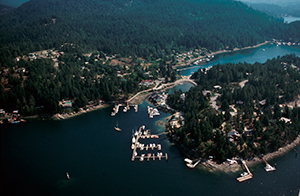 Pender Harbour includes the following communities: Garden Bay, Medeira Park, Irvines Landing. Wildlife: Blacktail deer, black bear and cougar can all be found in the park. There are opportunities for canoeing or kayaking in this park. Kayak rentals are located in Halfmoon Bay. Visitors may fish for salmon and cod. Anyone fishing or angling in British Columbia must have an appropriate licence. Licences can be purchase in Irvine’s Landing and Garden Bay. There is a hiking trail in the park but it is not accessible from the Marine area of the Park. Access is from Garden Bay Road. The Mount Daniel Trail is approximately 1½ hours to the top (4 kilometres from Garden Bay Road to the top). This is a moderate to difficult hike due to the steep grade of the trail. There is a great view of the surrounding area from the top. There are swimming opportunities in this park. There are no lifeguards on duty at provincial parks. The beach is relatively steep and rocky. There is a small dinghy dock. There is no viewing platform but there are spectacular views from the top of Mount Daniel. There is a water tap in the day-use area. Boil water advisory.